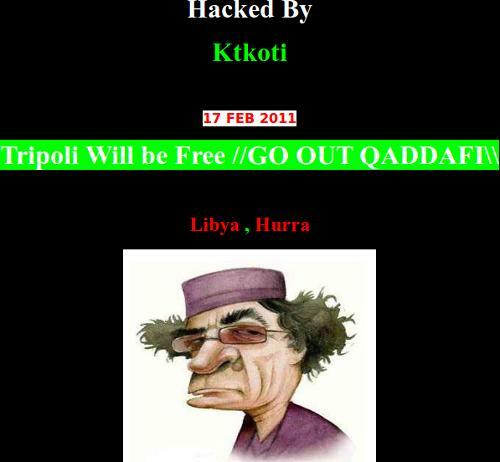 Libyan Satellite TV Website Hacked by Ktkoti and Most of Libyan media sites down ! The web site of the Libyan Revolutionary Committees Movement's newspaper Al-Zahaf Al-Akhdar (The Green March) is also offline, as is New Libya TV. A radio station set up and apparently owned by Sayf-al-Islam al-Qaddafi, http://www.allibiya.fm is offline, and the Libyan satellite channel's web site www.allibiya.com has been defaced, and its Facebook page taken over. Allibya.tv another domain for Sayf's media empire is also offline. Sayf-al-Islam's Charity Foundation, which has changed its domain name also at least 3 times and failed to build any audience, the latest listed as being http://www.gicdf.org is also offline, and the Twitter and Facebook accounts of Sayf-al-Islam al-Qaddafi have also been taken over. Many other Libyan web sites are "off air" having been removed either by threats against providers, defections, or various incompetence. All the sites lack technical abilities in terms of security, with the take-overs conducted with ease, using simple methods such as plain-text interception and false pages where passwords are entered, as well as straight forward hacking of personal computers, which mostly use windows. Mathaba, online since 1999, has not been hacked once in 11 years, as it runs on secure web servers and with advanced technical know-how. Like all sites, a large-scale "denial of service" attack will render a site inaccessible, and although subjected to some "DoS attacks" in the past, we have more reliable defences in place.